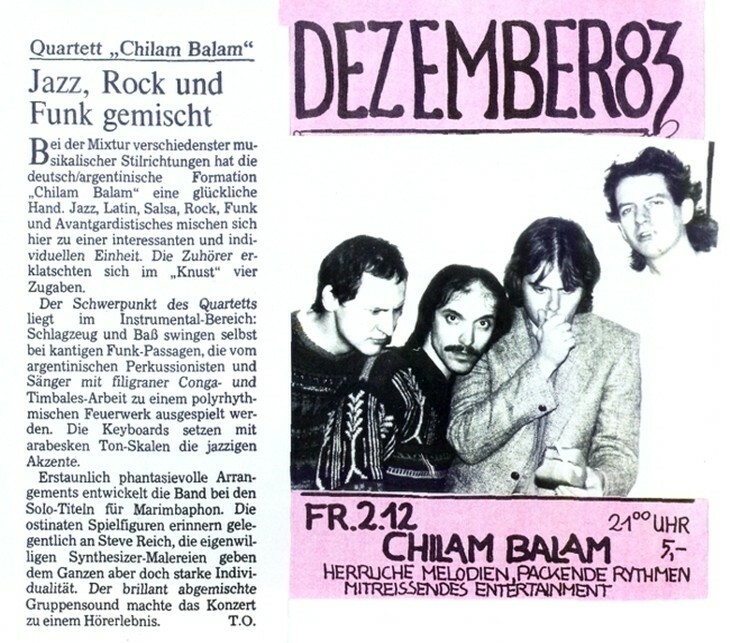 The German/Argentine formation "Chilam Balam" know what they are doing when they combine different musical styles. Jazz, Latin, Salsa, Rock, Funk and Avantgard are put together to create an interesting and individual unity. The audience at Onkel Poe's Carnegy Hall demanded 4 encores! The group focuses on the instrumental area: drums and bass are swinging even with square funk pieces, which are played outto poly-rhythmical fireworks by the argentine percussionist and singer using filigrane congas and timbales work. The keyboards produce jazz accents with arabesque sound scales. The group creates amazingly imaginative arrangements for the solo pieces for marimbaphon. At times you are reminded of Steve Reich, but the distinct synthesizer movements create a strong individual touch. The sound of the group - brilliantly mixed - made this concert an absolutely pleasant experience for your ears. DIE WELT - Hamburger Kulturberichte Nr. 276 - Saturday, 26. November 1983.